Ooh, feeling a bit harsh today....having scarfed down a record number of Chocolate X-treme Blizzards -- aka in my good books as 'Blizzard Perfection!' -- this month, I do feel a tad let down by the Blizz of the Month this go around. The title is VERY promising: Tin Roof Brownie Blizzard. If the name doesn't snag you into its frozen chocolately web, the brownies captured in the photograph surely will. But..... Houston, we have a problem.... namely, chocolate covered peanuts. Gasp! Wrong, so wrong.... one addition too many. I love peanut butter mixed in with my chocolate but not in the guise of their original nutty entity. 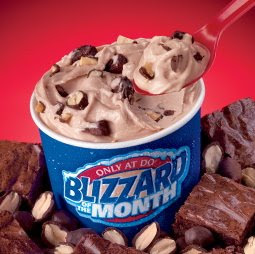 Say no to peanuts....cloaked in chocolate and hidden in your Blizzard.